OOOh not seen that book before. 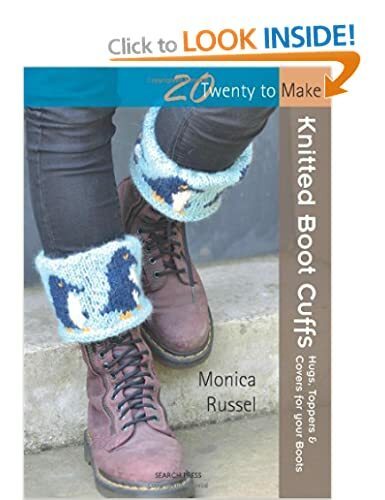 I have made a few pairs of boot cuffs and I am currently knitting another pair, just cast on until I had enough stitches and made it up as I went along though. Yeah I am doing the same, just never thought of doing them, so some ideas in there. Can you knit on DPNs or a circular needle Carolyn? This is something I have never really tried, once again due to me being left handed and the way I hold the needles. I do feel I am quite restricted in which patterns I choose. Perhaps this is another challenge I should set myself. now look what you made me do!! i had to order that book . Shame it's nearly all for thick wool .so now I've ordered some thicker wool too. I was hoping my niece might knit me some of these for Christmas but I was out of luck Maybe I should get her the book for her birthday next month, along with some wool as they look very cool! Glad to be of service Ellen maybe the book will be a good idea Clare. I made one - but have undone it as decided I wanted it on my short boots and it was more suitable for further up my leg where it is wider! How do you know it's the right size ? I made a pair , it's fine on the outside but how is the inside supposed to be? Does the cuff come off when you take your leg out? I made mine too big, and have done some smaller ones for shorter boots. I have made sure that they fit around the boots, but pretty sure that taking the boot on and off will make them come off, so will need to straighten them when I have them on.